ooh la la... if only... I could have Beverly over I know she would LOVE the PINK accents... oooh and we could listen to this music by Paris Combo... j'adore their musique! 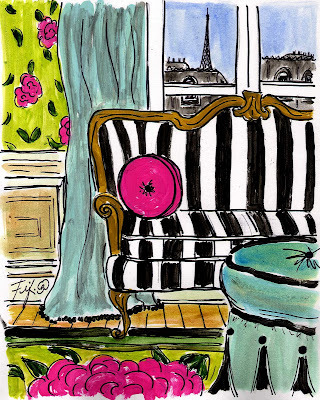 Do YOU dream of YOUR own Paris apartment? and REMEMBER to visit Reading is Fashionable EVERYDAY!!! Bella, Bella, Bella ~ I could easily catch a flight from this apartment to Anywhere in Europe. Fifi, seriously? That is my Number 1 Dream!! Love your new painting!! The 12 Days of Holiday Giveaways!! The French Basketeer has a special offering right now and there are more gifts open to enter! I don't dream of a Paris apartment..but I do dream of a weekend cottage by the lake...ahhhh! Another great piece of art. Just the right touch of pink. Yes, I am sure Beverly as well as the rest of us enjoyed seeing more of your talent. Love the composition and colours of this painting. You have captured the spirit of Paris. Perhaps that is dueto your desire to own un appartement parisien. I too have shared this dream, but my heart lies in rural France. Fabulous painting, dear Fifi. And, I do love those pink accents. I'll be right over.